An autotransformer can be used for step-up, step-down and split phase output balancing purposes. We offer a wide range of Battery Cabinets solutions. The current focus on renewable energy, coupled with the modern expectation to be able to use all mobile devices everywhere all the time. Victron battery isolators permit simultaneous charging of multiple batteries without connecting the batteries together. 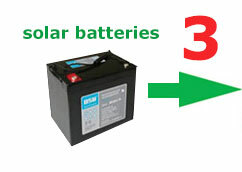 Battery Protector will cut the supply to your appliance when the battery voltage falls to the selected cut-off volatge. Bi Directional Inverters are used for grid-tie purposes, where surplus electricity generated by a home or business solar power solution, is sold back to the utility company. 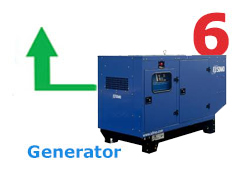 The energy solution for all types of power and applications from 1 kW to several megawatts. Gird Tie inverters are used for a solar system that does not use a battery bank and are connected to an electric utility company. Off-Grid Inverters are principally meant to be used with solar, wind or hydro power systems for a home, business or farm completely disconnected from the electric utility company. We stock all the extra's you might need - from cables to globes and more. Our range of solar batteries includes applications in telecoms, golfing and many more. Includes Sealed,vented, Lead Acid, Calcium 2V cells, gel, solar and ups. We carry a wide variety of battery monitor systems, meters and other accessories for keeping track of what is going on with your deep cycle battery system. All the solar components needed to asemble structures. Energy Saving - Solar Fridges & Freezers. We stock a wide variety of photo voltaic solar panels for various applications, including residential, rural, commercial, flexible and portable solutions. Solar powered pump for various applications. 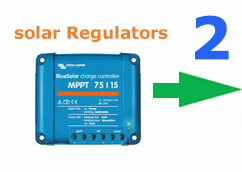 The solar regulator that controls the operating voltage of a photo voltaic array. View our range of solar structures to fit your every application. Our products for system monitoring offer you the widest range of possibilities. Transfer switches are an important element of any emergency power system. These switches are responsible for switches a load between two sources, usually between the mains and a backup power supply. 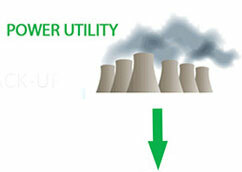 Transfer switches can initiate the start up of your generator when the power cuts. Why is solar the solution? Investment in solar energy and renewables - such as wind, biomass etc , provides an ecological and viable alternative to traditional fossil field energy that will reduce your carbon footprint and contribute to slowing climate change. 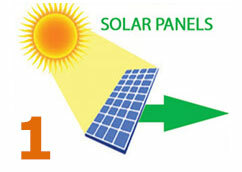 Here we bring you some of the facts about Photovoltaics, also known as solar electric. We show you the benefits - both cash and environmental. 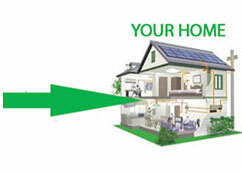 We also provide a step by step guide to help demystify the process and get you on your way to installing your own solar system. How energy gets produced from the sun? We offers a Point of Sale loan application solution that will benefit the customer. Monitor and configure all Victron products with built-in VE.Direct port, such as BMV Battery Monitors and MPPT Solar Charger Controllers. Need more information or not sure what you are looking for? What is your demand for energy? Download the Solar Energy Demand calculator to get an estimate.